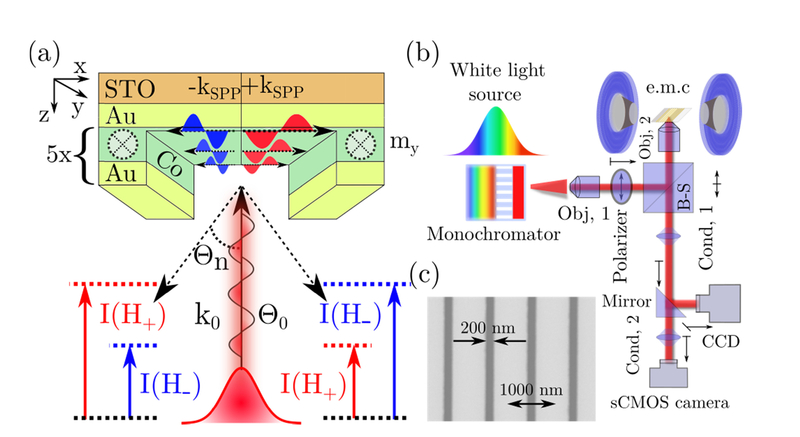 Phase-matching conditions—used to bridge the wave vector mismatch between light and surface plasmon polaritons (SPPs)—have been exploited recently to enable nonreciprocal optical propagation and enhanced magneto-optic responses in magnetoplasmonic systems. Here we show that using diffraction in conjunction with plasmon excitations leads to a photonic system with a more versatile and flexible response. As a testbed, we analyzed diffracted magneto-optical effects in magnetoplasmonic gratings, where broken time-reversal symmetry induces frequency shifts in the energy and angular spectra of plasmon resonance. These result in exceptionally large responses in the diffracted magneto-optical effect. The concepts presented here can be used to develop non-reciprocal optical devices that exploit diffraction, in order to achieve tailored electromagnetic responses.